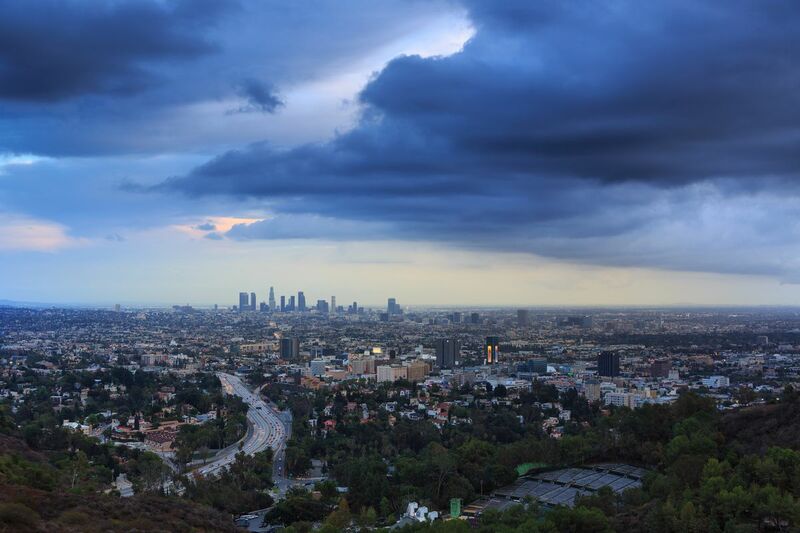 Los Angeles, California, could see wet weather this winter if a moderate El Niño occurs. Think back a few years to the winter of 2015-2016 and you might remember a plethora of headlines surrounding El Niño, a phenomenon that can influence weather patterns around the world. That winter, we wondered whether a record-breaking El Niño event could save California from drought and how it impacted snow in the Northeast. Now, El Niño is set to return. In an update from earlier this month, the National Oceanic and Atmospheric Administration (NOAA) confirmed that there’s a 50-55 percent chance of an El Niño onset in the U.S. through November. By winter, the chance of El Niño conditions increases to about 65-70 percent. But what does it all mean, and why should city dwellers care? Curbed breaks through the hype to tell you what exactly El Niño is and what you can expect this winter. El Niño occurs when ocean water temperatures in the central Pacific Ocean become warmer than normal. While this may not sound like a big deal, it can have profound impacts on weather patterns around the world. Some El Niños are strong and some are mild, but all El Niños influence global weather patterns. You may have also heard of El Niño’s counterpart, La Niña. La Niña refers to times when waters in the tropical Pacific are colder than normal. Typically, El Niños occur more frequently than La Niñas. When does El Niño happen? 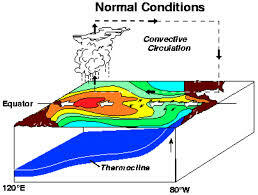 El Niños occur every 3-5 years but can happen as often as every two years or as rarely as every seven years. Each event usually lasts 9-12 months, develops in the late fall or early winter, and usually peaks in January or February. It’s important to remember that El Niño is not a single storm; it’s a long-lasting weather phenomenon. Weather is weather. Why do El Niño’s matter? Simply put, strong El Niños can cause more extreme weather events. 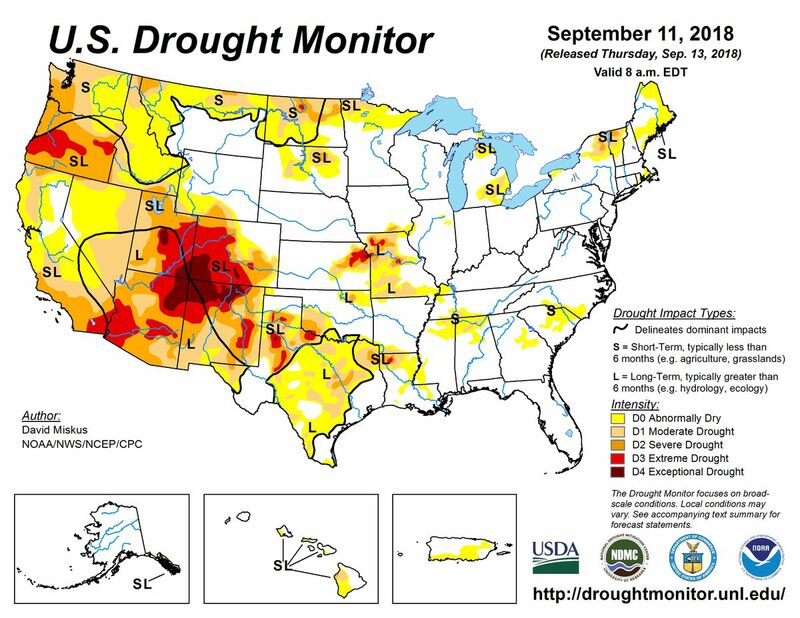 The El Niño event in 2015-2016 caused severe drought in Southern Africa, flooding in Peru, and severe flooding along the Mississippi River. According to CNN, the 1982-1983 El Niño caused more than $8 billion in damage worldwide. The 1997-1998 event resulted in flooding in the southeast, a severe ice storm in the northeast, $550 million in rain and flood damages in California, and tornadoes in Florida. Overall, the last strong El Niño resulted in $35 billion in damage and 23,000 deaths worldwide. The usual forecast if El Niño develops this winter, although the forecast can change depending on how strong or weak the El Niño is. What does El Niño mean for forecasts this fall and winter? Each El Niño differs in intensity and duration, so no two El Niño events are the same. But historical data does offer some insight into what we can expect this winter. 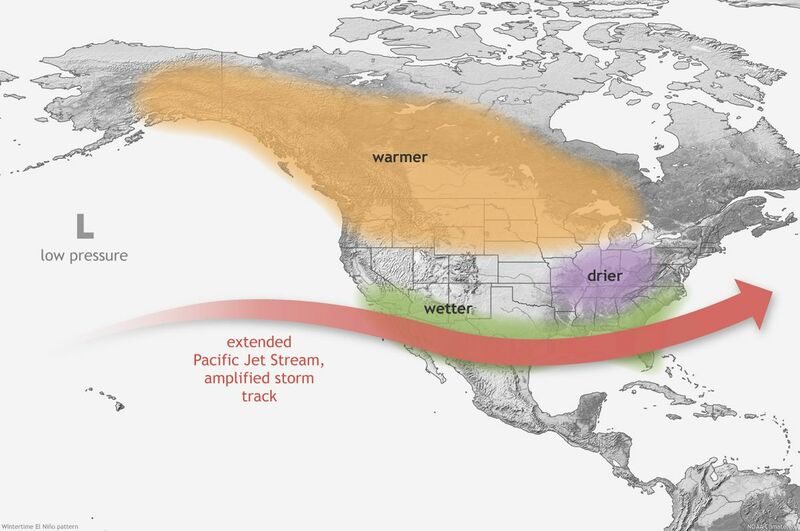 When an El Niño is in effect, it often shifts the path of the mid-latitude jet streams that are essential in pushing storms from the Pacific across the U.S.
During an El Niño winter, the Pacific jet stream can stay in the lower half of the country, allowing for wetter than usual weather in cities like Los Angeles, New Orleans, and those in southern Texas. Meanwhile, cities like Portland and Seattle could be drier than normal, and the large cities on the eastern seaboard—think New York, DC, and Boston—are often warmer than average during an El Niño year. NOAA’s current seasonal three-month forecasts show these typical El Niño effects, with a warmer than average northern half of the country and wetter than average conditions in the southern half. Wet weather would be a welcome sight to many cities in the southwest after a dryer-than-normal winter last year returned many states to drought. But areas that were devastated by wild fires—California in particular—need to be on alert; heavy precipitation could also cause dangerous mud slides in new burn areas. For cities like Los Angeles, it’s a balancing act between needing precipitation to mitigate a persistent drought, but not receiving so much rain or snow all at once that it overwhelms a fragile ecosystem plagued by fire. If a moderate El Niño develops, it could help mitigate drought in the southwest, and worsen it in the northwest. El Niño can have a big impact on where and how much it snows, so whether you love skiing or hate the snow, pay attention. The expert meteorologists at Open Snow crunched the data to see how the previous ten El Niños influenced the snowpack. According to Open Snow, a weak El Niño usually brings less precipitation for most of the western U.S., with average snowfall in New York, Boston, and the ski areas in the northeast. If this winter’s El Niño comes to fruition, but isn’t very strong, this is what you can expect. A moderate El Niño—which is what the forecast currently calls for—usually results in above average rain and snow in California, Oregon, and Washington, average precipitation in Colorado, and a wet winter in the southeast. In both cases, the midwest—Chicago, we’re looking at you—is usually much dryer than in a La Nina event.